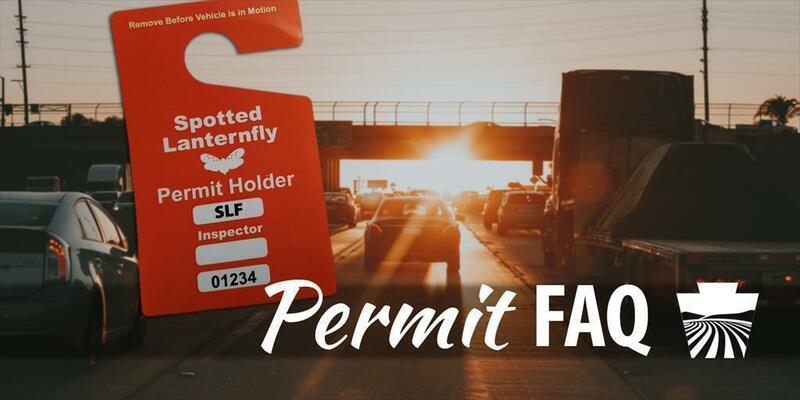 ​Spotted Lanternfly permits are designed to raise awareness for businesses working in the quarantine area and to allow continued safe trade for companies. We need your help to help us contain this invasive species, but how can you help? The state of Pennsylvania has a Spotted Lanternfly quarantine zone of Berks, Carbon, Chester, Delaware, Lancaster, Lebanon, Lehigh, Monroe, Montgomery, Northampton, Philadelphia, and Schuylkill counties. What can those inside the quarantine zone do? Businesses and organizations conducting business in the quarantine zone need to obtain a permit from the Pennsylvania Department of Agriculture to move vehicles, equipment, and goods within and out of the zone. How do I know if my company needs a permit? if you are unsure if your business or organization is required to carry permits you can read Penn State Extension's article about requirements for obtaining a permit. How can I obtain a permit? The permit training and testing resources are available through Penn State Cooperative Extension: https://extension.psu.edu/spotted-lanternfly-permit-training. There are three sections in the course, with a quiz at the end of each sections. A score of 70 percent or greater is required to pass the exam. Should all business employees take the exam? No. The exam is a "train-the-trainer" course to train designated employees, usually an owner, manager, or supervisor within the company on how to comply with the quarantine regulations. The person taking the exam is responsible for entering the number of permits needed for each of their company vehicles. Once this employee passes the exam, he/she is then responsible for training other employees who are responsible for driving any company vehicle or conveyance, or handling, shipping, packaging or loading any regulated article. Once you take the permit exam, you can expect to receive the physical permit in the mail within two to three weeks. You may make copies of your passing certificate to use temporarily, until the official permits arrive. Why should businesses obtain a Spotted Lanternfly permit? The permit indicates that the permittee is aware of the Spotted Lanternfly and follows procedures to prevent it from spreading. The physical permit is a hangtag for rearview mirrors and a decal for tractor trailers. What could happen if businesses cross state lines without a permit? The state of New York will honor the Pennsylvania Spotted Lanternfly permits issued by the Pennsylvania Department of Agriculture to businesses operating in the quarantine. If your business works within the quarantine area and moves products into the state of New York without a permit, you may be issued a notice of rejection by the New York Department of Agriculture and Markets. If your company receives three notices of rejection, the conveyance may be denied entry into New York. What does the quarantine restrict the movement of? Outdoor household articles including recreational vehicles, lawn tractors and mowers, mower decks, grills, grill, and furniture covers, tarps, mobile homes, tile, stone, deck boards, mobile fire pits, any associated equipment and trucks or vehicles not stored indoors. Who should I contact if I have a question regarding Spotted Lanternfly permit? For permit-specific questions, contact slfpermit@pa.gov. if you wish to schedule a meeting, go to http://extension.psu.edu/spotted-lanternfly.